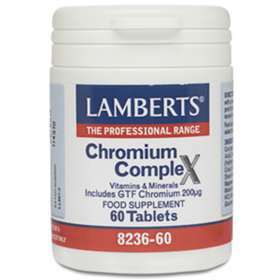 Chromium Complex is a one-a-day formula that provides relevant levels of those nutrients required to help maintain normal blood sugar (glucose) levels. Including a full 200µg of chromium GTF that is probably the better known of all the blood sugar controlling nutrients. Aids in balancing blood sugar levels. Ideal for those who suffer from food cravings. Can help treat Candida albicans/yeast infections. Particularly beneficial for those with Syndrome X.
Chromium is an essential nutrient that is vital in regulating blood sugar levels and along with vitamin B3 and the three amino acids: glycine, glutamic acid and cysteine, acts as a part of the glucose tolerance factor (GTF) that balances the action of insulin. Chromium is depleted from foods by processing and refining and consequently some people obtain inadequate intake from their diets. Signs of chromium deficiency include; poor concentration, light-headedness, fainting, hunger pangs and cravings. This formula is ideal for those with food cravings (pre-menstrual and non-cyclical) and other blood sugar imbalances, including low blood sugar (i.e. hypoglycaemia), and as support for aandida albicans sufferers. It is also very relevant for those with syndrome X; the name given to a group of symptoms which indicate that the body's systems have become 'resistant' to the hormone, insulin. Diabetics are advised to consult their medical practitioner before using this preparation. Daily intake should not exceed 200µg. Vitamin C 100mg, Thiamin 5mg, Niacin 5mg, Vitamin B6 5mg, Magnesium 300mg, Zinc 15mg, Copper 500µg, GTF Chromium 200µg. Tableted with: Cellulose, Tablet Coating (Hydroxypropyl Methycellulose, Colour: Titanium Dioxide, Glycerin), Stearic Acid, Silicon Dioxide, Magnesium Stearate.